When Nomos lent us several watches to wear, I wanted to go with the most unconventional model. That’s why I chose the Tetra Nachtijall, a small and mysterious watch that I couldn’t wait to discover. The Tetra collection is probably the edgiest collection from NOMOS thanks to its square case form. 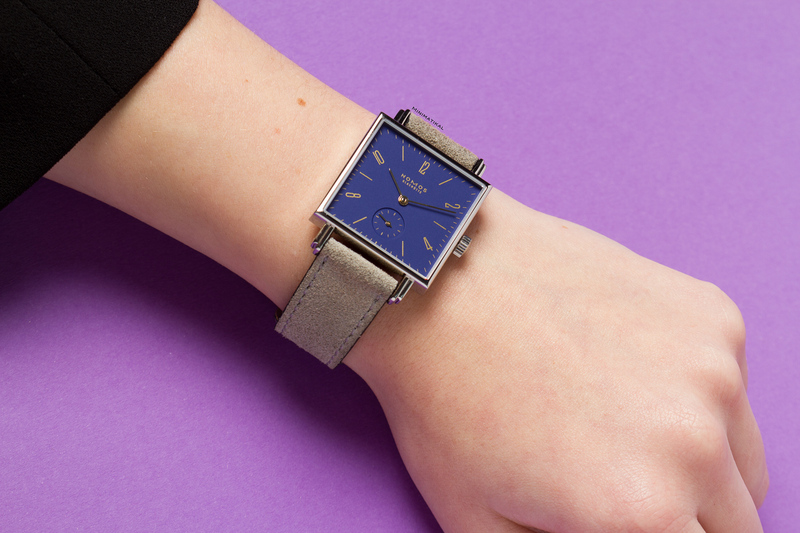 Sometimes square watches simply look and feel better on the wrist. According to Nomos “Tetra is a fine Glashütte timepiece: straightforward, clear, and perhaps rather independent-minded”. The collection is mostly known as the square version of Tangente, but its typography is not identical. The numerals on the Tetra are slightly elongated, and more narrow than on the Tangente. – The Tetra Neomatik: extra large (33x33mm), extra thin, with the automatic caliber DUW 3001. – The Tetra with manual winding: entirely classic available in 27.5×27.5mm or 29.5×29.5mm. – The Tetra Berlin set: best-known their boldly colored dials. The Tetra Berlin set was released in 2014. Every member of the Berlin set highlights a significant symbol of Berlin and has gold-plated hands. A nice tribute to the German capital, and home to Nomos’ in-house design studio, Berlinerblau. The Tetra GOLDELSE, inspired by the golden statue crowning Berlin’s Victory Column. The Tetra KLEENE, “little one” in Berliner dialect, with an eye-catching turquoise dial and the hand-wound caliber DUW 4301. The Tetra CLÄRCHEN, a tribute to the renowned Clärchens Ballhaus (dancing hall) in central Berlin – featuring an audacious billiard green colored dial. Last but not least, the intriguing Tetra NACHTIJALL. In my opinion, the Tetra Nachtijall is the most poetic and mysterious watch of the Berlin set thanks to its deep midnight blue dial. The case size of the watch, a 29.5mm square, flatters small wrists. However, I disagree with people saying that the watches in the Tetra Berlin set are the most feminine in the Nomos collection. I believe that a “small” square watch can also be a real statement piece for a man. Of course, the watch appears to be quite small comparing to the 40 to 44mm watches many men wear today, but the subtlety of this timepiece can be way more powerful than any other ostentatious, oversized watch. Sometimes, less is more. It is true that wearing a square watch is quite unusual. The sharpness of the case can be confusing at first. But the Tetra is incredibly thin and lightweight which makes it easy and comfortable to wear. The hands on the watch still move around in a circle; the Tetra functions the same way as a round watch would.The strap is soft and flexible and its neutral color creates a nice contrast with the deep blue dial. The Tetra Nachtijall adds a touch of originality to any outfit with its bold color and interesting form. Moreover, the gold hands and numerals make it easier to mix and match the watch with gold jewelry and accessories. The Tetra Nachitjall is powered by the hand-wound Alpha movement- Nomos’ oldest caliber and most popular one. A short summary of the technical data: diameter 10½ lines, power reserve circa 43 hours. With stop-seconds mechanism, Glashütte three-quarter plate, Glashütte stopwork, Triovis fine adjustment regulator, and 17 jewels. One might wonder, where did the Tetra Nachtijall get its name? ‘Nachtijall’ translates to Nightingales in English. A Nightingale is a small passerine bird best known for its powerful and beautiful voice. The song of the nightingale has been described as one of the most beautiful sounds in nature, inspiring songs, fairy tales, opera, books, and a great deal of poetry. According to Nomos, there are more nightingales in Berlin than in any other city, as Berlin is on their migratory path. Scientists from the Freie Universitat in Berlin discovered the mystery behind the nightingale’s beautiful song. Male birds sing complex notes to prove to females that they would be a good father to their children. Nomos has succeeded once again, in creating a seductive timepiece representing a perfect mix of traditional elements and modern design. The Tetra NACHTIJALL is available for purchase at www.AceJewelers.com.